This write up is in progress…more updates to come. I was never a runner. The most I ever ran was just a mile on the treadmill at the gym to warm up to do other activities. I would even say I hated running and the idea of it. I always liked being active, but my diet was poor and my activity level low and not consistent. I was searching for something to do. I had a boss that ran and raced regularly. She is awesome and I loved hearing about her racing, but I still couldn’t see myself being like her although I very much wanted to be. Then one day (March 2007) a co-worker asked me to run a 5K the next day. I’ve always had an adventerous side and just doing something new and daring considering I had no training was all I needed and said ‘Let’s do it’. It was a very cold race and not flat. It was 8 degrees and snowing. 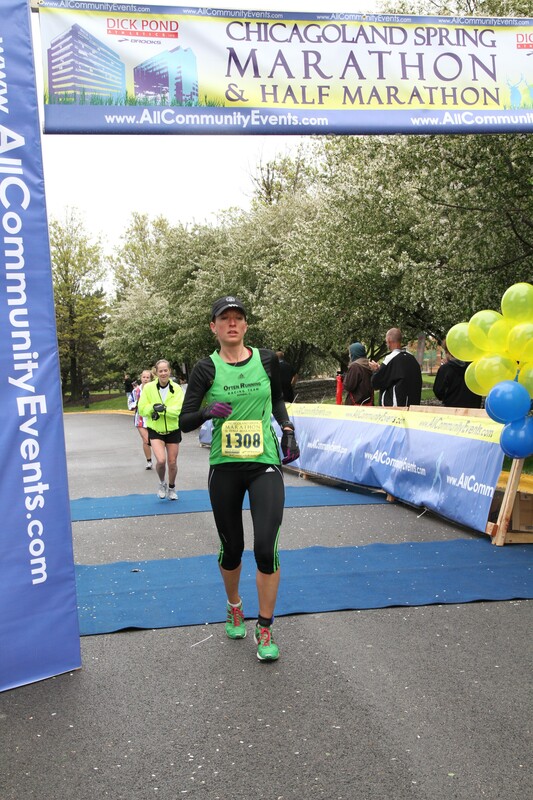 I had shoes that were too tight (as I had not yet been to a local shoe store for a proper fitting), two coats (yes two), two hats (yes I was over dressed) and I “ran” my first 5K. It was a miserable site, but afterward I thought I had climbed Everest. 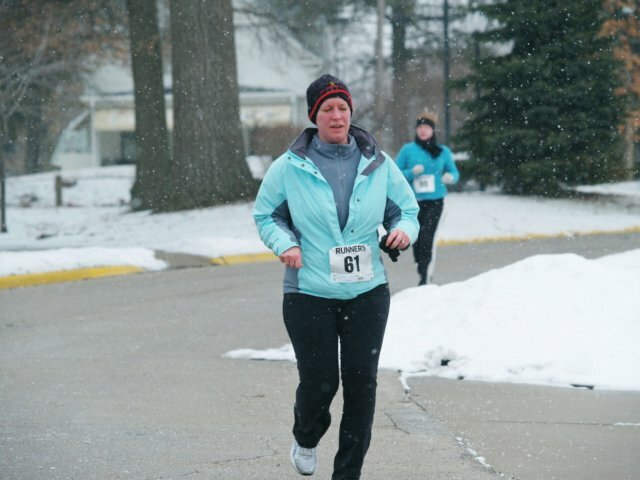 Here I am near the finish, working my heart out to complete this race. The feeling of pride and acheivement was so amazing. I was hooked. I was ready to see if I could improve on my efforts and said ‘When is the next one?’ Two weeks later I was at it again. I completed 25 races that year with my longest distance being a 10K and I set 2008 to continue to run as many races I could and train for my first Half Marathon. After the first six months of running my body aches and pains subsided and it became more enjoyable. Learning about injury prevention, staying consistent with running, and eating better all helped me stay on track. I learned quickly that having races to look forward too keeps me committed. The belief that I could do better kept me moving forward. 2008 brought 28 races, including my first half marathon, Go! St. Louis. My times continued to drop in all distances that I ran and the half marathon brought about another level of pride and accomplishment. 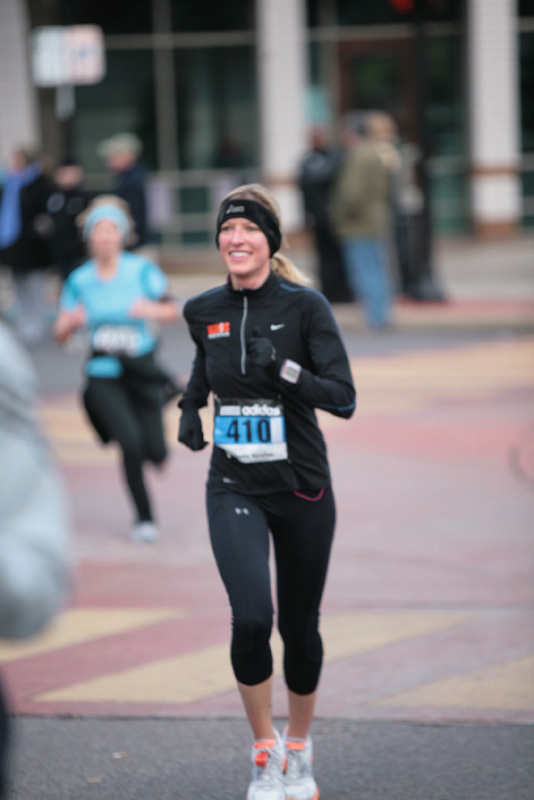 Running 13.1 Miles felt like running across the country and it made me feel so alive. I learned that I love longer distances, but there is value in racing all types of races, short and long. 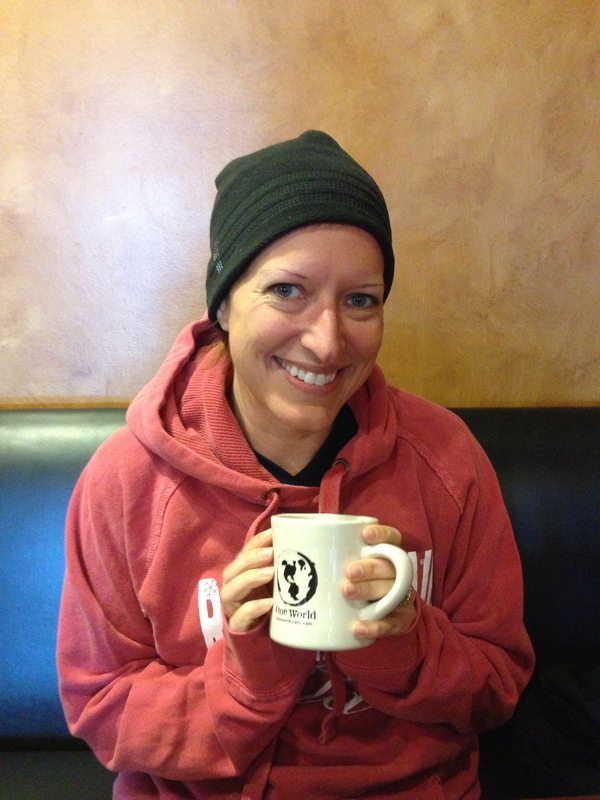 I learned about training plans (Runner’s World Smart Coach) and how to fuel for longer distances. The opporunties to improve in running are limitless. There is always a new race course, PR, weather conditions to over come. Each accomplishment brings with stories I will share for a lifetime…..bring on more! 2009 I decided to set my goals to run 3 half marathons. My husband Rob had always done the occasional race here and there with no training. 2009 he made the decision to become serious about running as well and requested to be registered for every race that I did. That meant 29 races for the year! The biggest part of the year was Rob encouraging me to run my first full marathon, Chicago Marathon, that he too would train and race for. 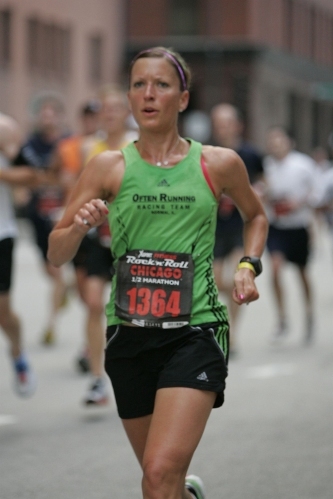 The 2009 Chicago Marathon was an experience like no other. It’s difficult to describe the feeling of having so many people watching your race, giving off all of this positive energy. Along the way Rob and I have also lost weight and improved our nutrition, something that has made running and life in general more enjoyable. 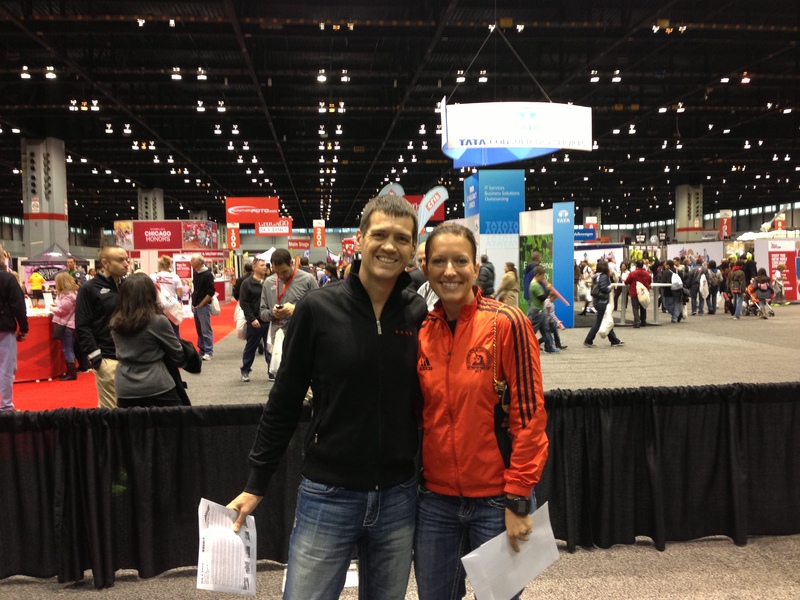 Rob and I are motivating others with our love of running to get out there and try it for themselves. I find a sense of community on the Internet and in everyday life from other runners. Hearing about others accomplishments keeps me motivated to keep going. I’m so proud of Rob and know that we are saving our lives by having a healthy lifesytle that we will keep forever. 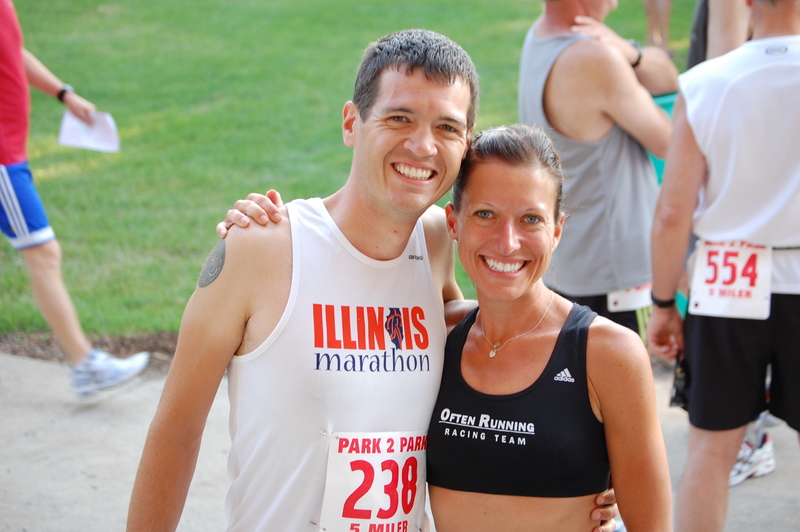 2010 Rob and I continued to run many races, but we then trained and raced three marathons, Merecdes Marathon, IL Marathon and Chicago Marathon. Each one was very special to me, especially because I qualified for Boston Marathon and improved my time in each of them. 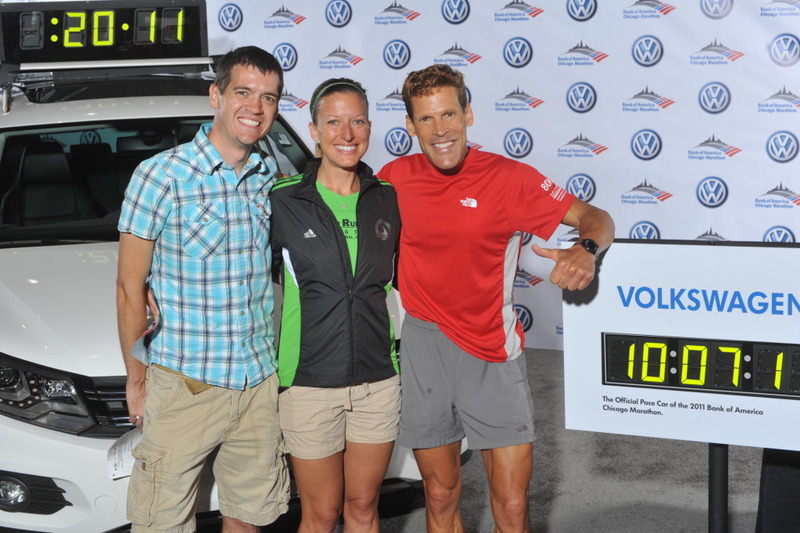 Along the way I got to meet up again with Nic and also met another fellow running blogger and friend Stevi. 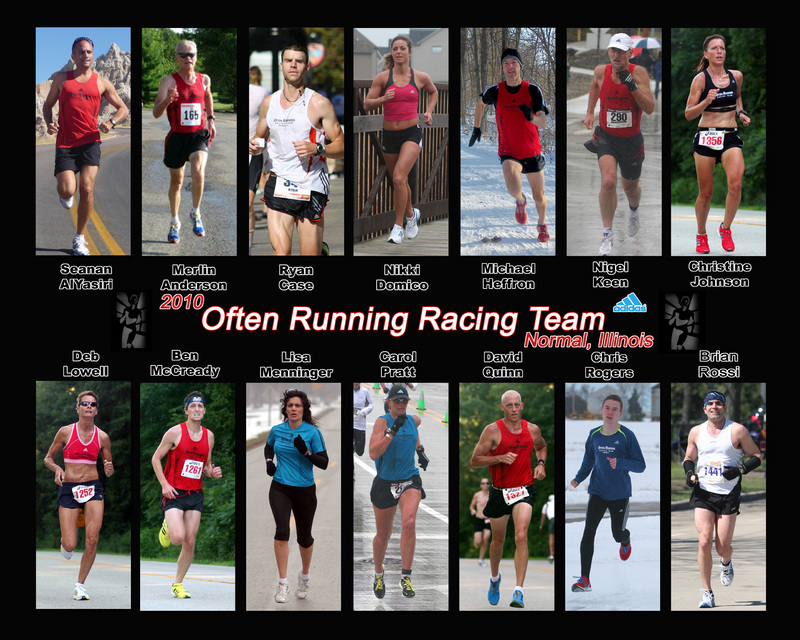 I also got to be a part of the Often Running Racing Team. 2010 was also the first year that I ran over 2,000 miles! I learn that I’m stronger than I give myself credit for. 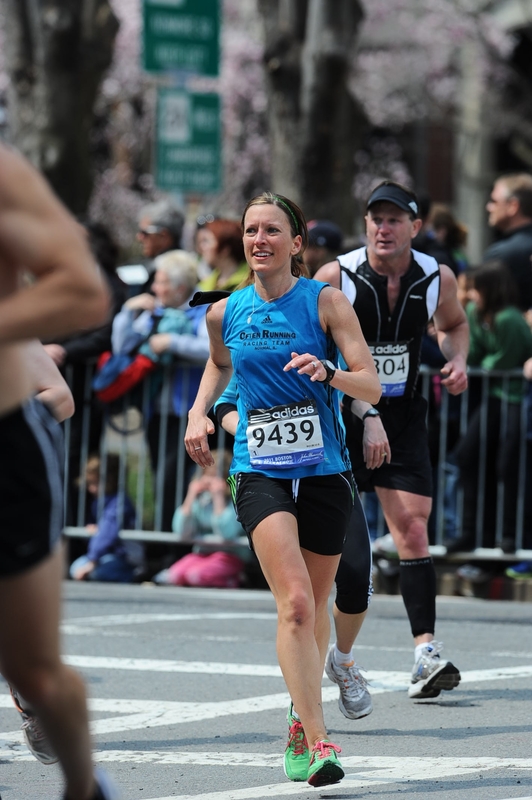 I would find myself discounting a new race pace or PR without even going for it. I learn that belief is so key. And when disappointments do come, because they will, to know it’s not just about one particular race….it’s a lifetime commitment to get up and try again. I also learn to stop comparing myself to others or even my very own self in past performances. I realize that it’s not fair to say “I ran better last time” or “that person doesn’t train as hard/want it as much as I do, why am I not able to perform like that?”. It’s an unfair and damaging cycle to entertain thoughts that won’t help me become a better runner. Acceptance of myself has become key. I will never give up running, even if I never achieve a particular race pace or accomplishment. And I have stopped comparing myself to others as well. I feel forever changed from the inside. 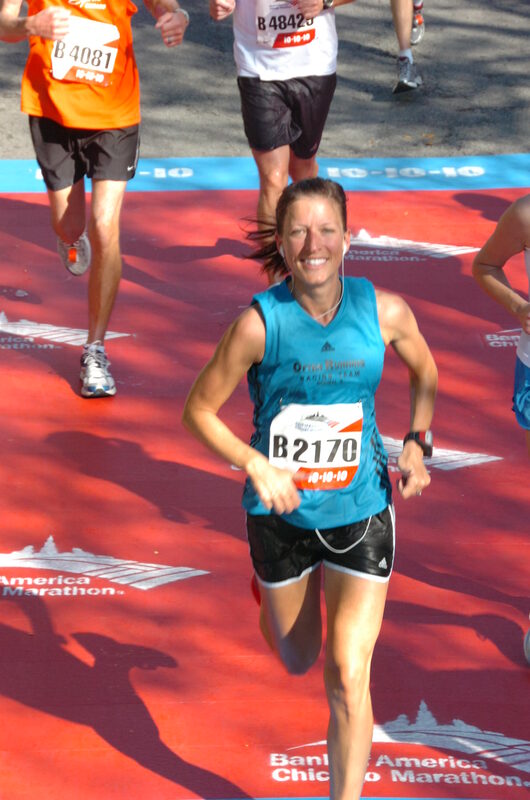 2011 did bring a lot of new experiences in running. 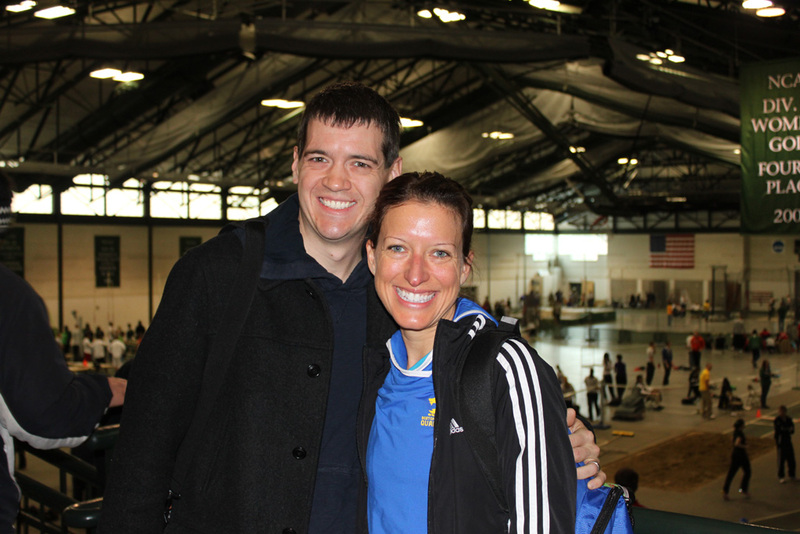 I ran my first indoor track meet open and it was painful, like racing a new distance for the first time. I’m so grateful to have had the opportunity and be able to say I got to try it. I continued to suffer with stomach issues. Over the year I tried so many changes to my diet, trying to figure out what was triggering my issues. I ran my first Boston Marathon!! Still my love for running was tested with very terrible stomach issues while racing. My limits both physically and mentally were tested at this race. I met some more amazing people! I did have some races that were enjoyable considering my stomach was an issue so often. 2012 would be a bitter sweet running year because of no new PRs, but the best gift of all, becoming pregnant! 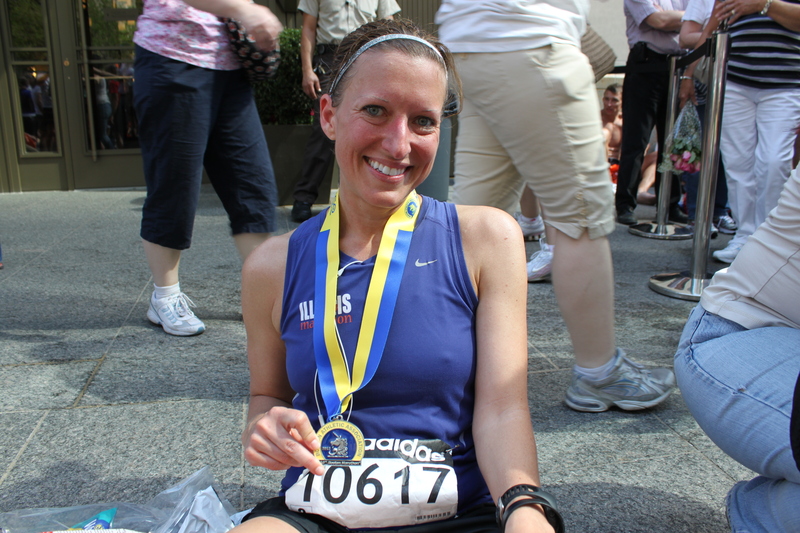 For the highlights, I got to run my second Boston Marathon in upper eighty degree weather. This became a race of just doing enough to make to make it to the end without bonking in the heat. 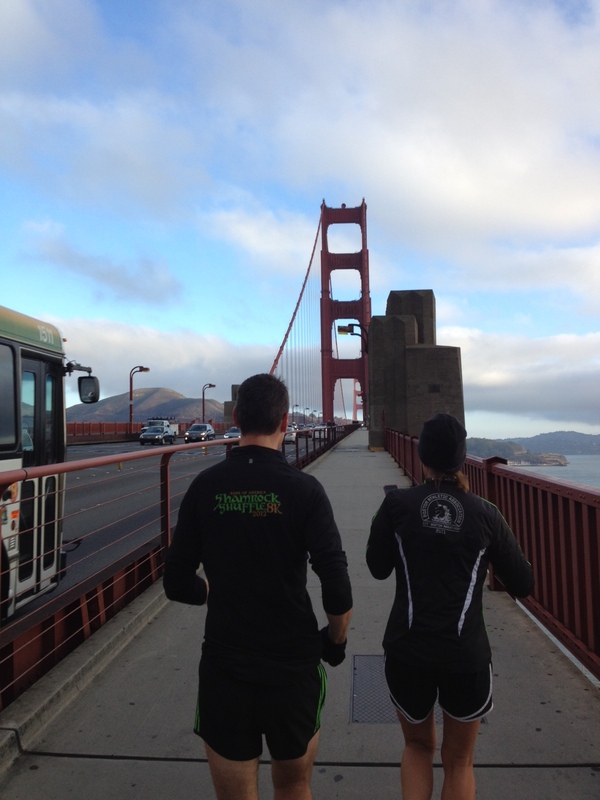 While in San Francisco for work, we did a long run of 13 miles and we got to run across the Golden Gate Bridge, little did I know I was pregnant. 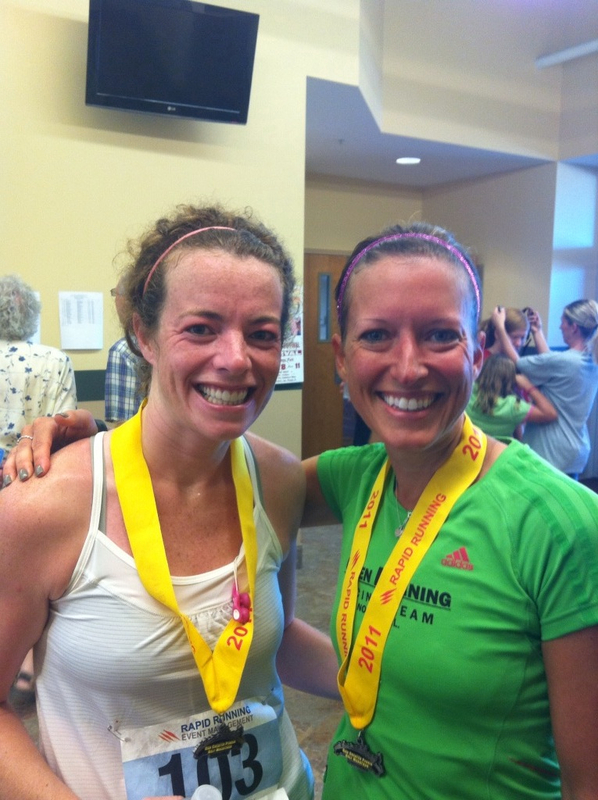 And then I ran the following 2012 races pregnant…. 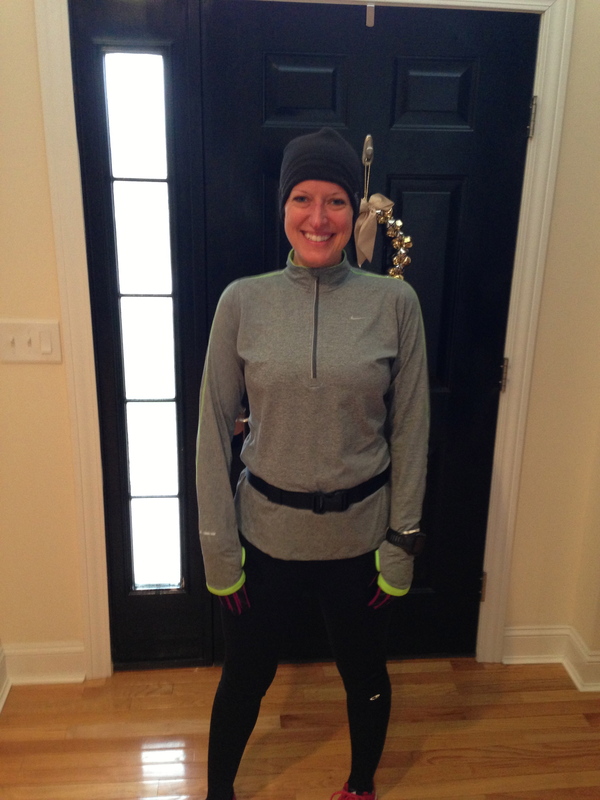 To end 2012 I did long runs of 16, 18, and 20 miles before ending my long runs after the first trimester. I just absolutely love following your blog and reading about all your accomplishments! You are such an inspiration and I just want to say thanks for documenting your running/races because they really motivate me to become a strong runner like you one day! Hey Dana! Thanks for the sweet comments! It motivates me to hear from others and see their training too. Good luck on your two half marathons this spring! I was searching for Boston jacket images, and I found your site. This will be my second Boston, and I love my jacket from last year. This year’s green/black jacket doesn’t have the big emblem on the back, but I noticed the black and white jacket you have featured on your site does. Where did you get it? Thanks. Good luck at Boston! Hey Brooke! I went to the adidas website and did a search for “Boston Marathon” to see the gear they had available this year. I took a quick look to see the issue and you are right the jacket style “Boston Marathon Supernova Conv. Jacket” does NOT have the large logo on the back. The jacket I purchased is no longer showing on the site. I wonder if they sold out temporarily? Keep an eye on the site because I see that they have added some bags that weren’t there before too. I will look to see if I can find the style name for my jacket to post it. Good luck with your training! It was so awesome to meet the both of you in person at the finish line last Saturday at the Lincoln Presidential Half Marathon, in Springfield, Illinois. Thanks for mentioning me in your post about the race. I have signed up for future posts to your blog, as I enjoy reading about your running adventures and accomplishments. 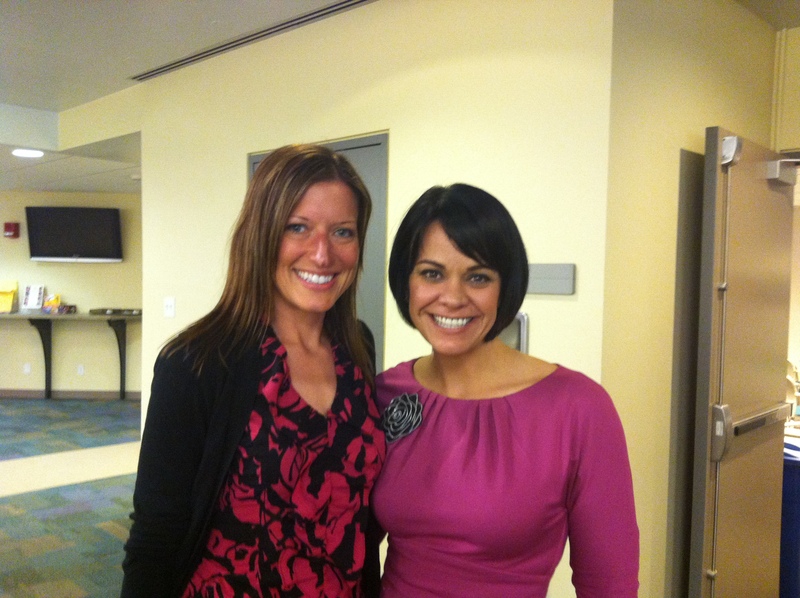 You are both an inspiration to many and I look forward to reading your update after the GO! 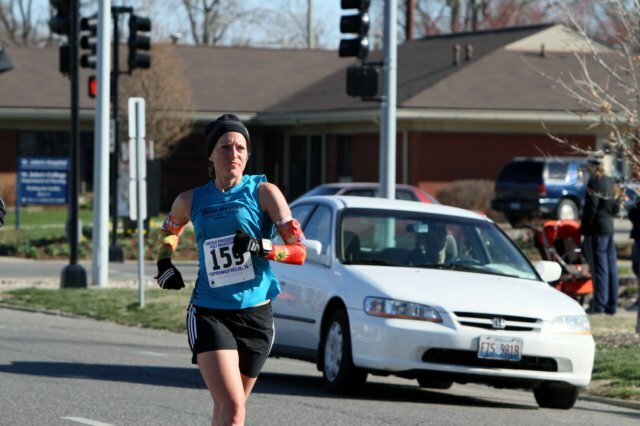 St. Louis Half Marathon on Sunday. Love reading your blog! I was at the Go! St Louis this past weekend also – doing my 2nd half! You are so inspiring! I just wanted to ask you- how you improved your times so much as you started running? I have been running for awhile and seem to just sort of plateau on my time– Any secrets/words of advice??? Glad your race went well yesterday- (as brutal as it was!!!!) Thanks for the great info on your blog! Hi Christine! Congrats on your awesome finish in Boston. I’m somewhat new to running and I was hoping you could fill me in on the training plan you used when you first started running. Your progress has been simply amazing. I’ve always wanted to run long distances but don’t know where to start. Hey Erica! I started with Runnersworld.com smart coach to build training plans. The site has tons of information and videos that are full of info to get started. Enjoy the process and have patience as your body adjusts into training. You’re an inspiration! I am trying to lose the last 10 lbs to get faster… Did you follow a training schedule to help get you to faster? Yes for uping training I moved to Advanced Marathoning book. I love reading your journey. I always look forward to reading about your races, your current training, etc…! I just wanted to say I love your blog, I am way to new to this running thing. 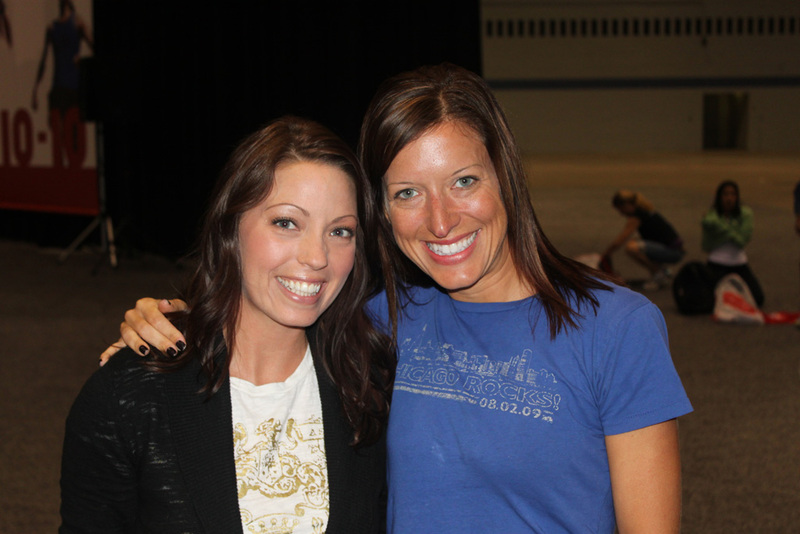 My sister-in-law on the other-hand is not and suckered me into the Rock and Roll Chicago this year, I never thought I would have the courage to do it after so little training, so far and so long. 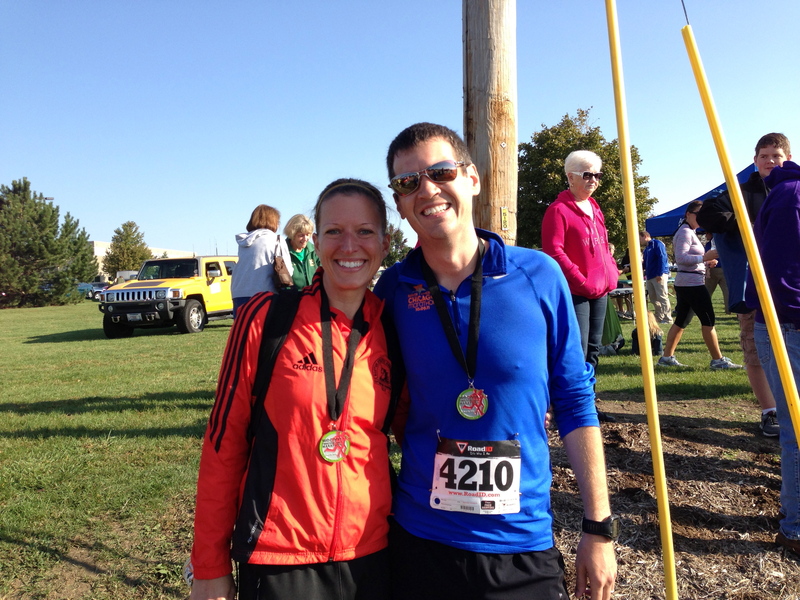 I finished 3:05:16, I guess a new personal record….lol. I remember seeing you and Rob and someone said that’s Fly Runner, so I kept you two in mind an when I got home, I found the blog and signed up for another 1/2. I just wanted to say I love your story and I will continue this new addiction. The goal is to drop a few pounds, like 35…lol and really hit this up. I can’t wait to see you and Rob’s next adventure, you ROCK! I love this About Me page, especially the lessons learned. Those photos really tell a story, you have seriously changed your body and you look like a different person. You are so inspiring, I love reading your blog. I cannot believe how fantastic you look from running. Keep up the good work and tell me how to get your killer legs. 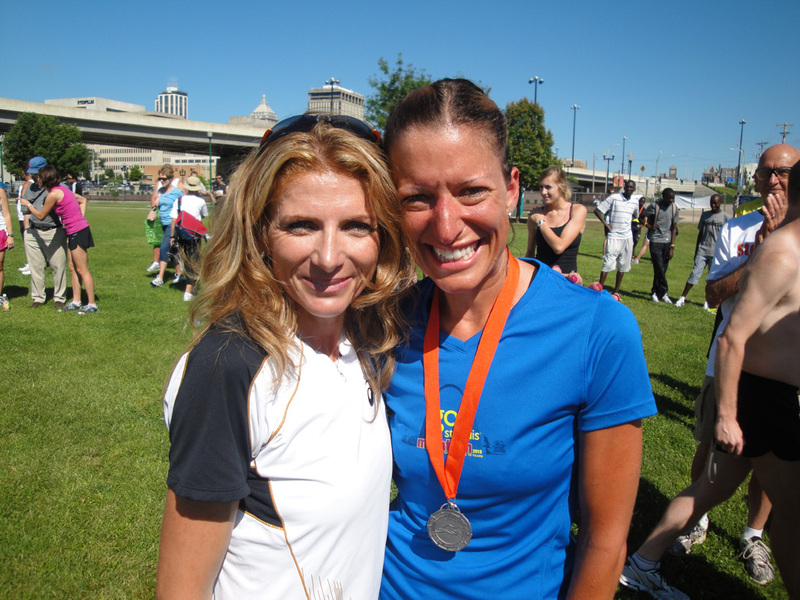 you are a running inspiration and i loved how you formatted your years with the lesson learned. i cant wait to keep following along as you race more, improve whatever else you want to improve, and live such a fulfilling life! Thanks Alaina! I’m glad you like the update to include lessons learned. It seems like I learn so much each year that has more than just a new type of workout or drill. Running has transformed me inside out, so I hope that others can relate to the experience. 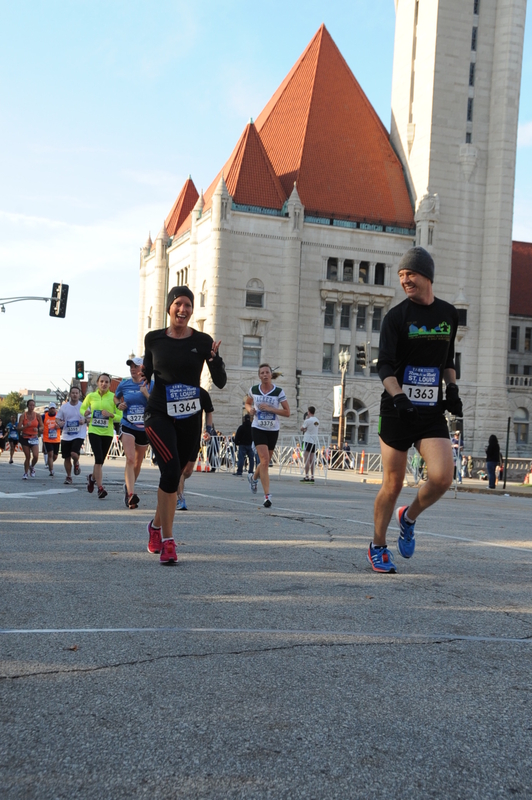 have you ever run the chicago monster half-marathon??? No and I haven’t heard about it before. I will search on it now. Have you ran it? Did you like it? Glad I happened to stumble upon your blog. Awesome reading about your journey. I started running less about a year and a half ago, and I’m 10 years older than you. I always loved sports – playing and watching, but never had an interest, much less considered running until my personal trainer suggested as a way to amp up my cardio in my quest to lose weight and just be more fit. Now, about 35 pounds lighter, I don’t even focus on the weight-loss benefit. I LOVE running. It has become my passion – something many don’t “get”, but something I will do for the rest of my life. I have several 5Ks, 8ks, a 10K and the Chicago Half Marathon – as of last month – under my belt. In my mid-40’s now looking to do another half next May and the Chicago Marathon next October. I am a runner for life. Looking forward to seeing more from you. really inspiring! I love running and aviation too. I’m also a fan of Adidas Adizero shoes. I wear the first generation Adizero Boston. It’s still holding up after 6 months of use on the treadmill. A very light trainer, yet stable and keeps me from injury for the knees. I think I’ll check out the Adios if I see it at the Adidas Outlet. I’m planning to run my first marathon next year. That is a funny commercial! Glad you are liking the Bostons! !